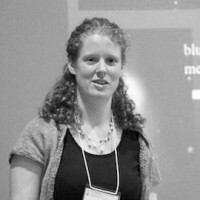 Anne-Marie Weijmans has spent much of her career studying the dark matter haloes of galaxies. The halo is the most massive component of a galaxy and plays a critical role in the system’s formation and evolution. Weijmans maps the invisible halo by measuring the movement of objects we can see—stars and gas in a galaxy’s outer reaches. Weijmans also studies very distant, high-redshift galaxies and is a member of the MaNGA project to obtain spectra of 10,000 nearby galaxies. She was one of the first two Dunlap Fellows and, in the summer of 2013, joined the School of Physics & Astronomy at the University of St. Andrews, Scotland, as a lecturer.